Not some crazy new dialect, but standard British vocabulary, according to the latest edition of the Oxford English Dictionary, published Friday. The publishers said they have added almost 6,000 new words and phrases that reflect 21st century life, including the frowner's favorite, Botox, passion-enhancing drug Viagra and sambuca, the aniseed liqueur served with a flaming coffee bean. 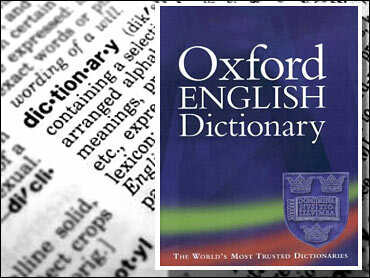 Among the 187,000 definitions in the latest edition, published by Oxford University Press, there is also bevvy - British slang for a beer; head-case, referring to a person who exhibits irrational behavior; and bling-bling, a reference to elaborate jewelry and clothing, and the appreciation of it. Half-inch, Cockney rhyming slang for pinch, or steal, also makes it into the dictionary this time around. Some of the new terms, including cut-and-paste, screensavers and search engines, reflect the growing influence of computers, while hands-free phones and phreaking, the expression for hacking into phone systems for free calls, acknowledge developments in telecommunications. Other corporate-speak considered established enough for inclusion in the dictionary includes dot-coms, or Internet companies, and blipverts, subliminal TV adverts of just a few seconds' duration. And J.R.R. Tolkien's fictional world in "The Lord of the Rings" is also recognized. Orcs are defined as "members of an imaginary race of ugly, aggressive human-like creatures." The dictionary says the word probably comes from the Latin orcus meaning hell, or the Italian orco, meaning monster. Getting down to basics, the new dictionary now makes it all right to describe the khazi (toilet) as minging (disgusting).